Getting credit for the first time isn't always easy. Most creditors want you to have credit before they'll give you credit, which makes it kind of tough to get started. Once you've gotten credit for the first time, the next time will be a little easier. The best way for a beginner to get credit is to apply for a credit card targeted for people who are new to credit. If you already have a checking or savings account, check to see if your bank has a credit product meant for someone with limited credit history. The bank may offer a student or secured credit card or a credit builder loan. If you can't get started with credit using your own bank, there are other options. Getting a retail store or gas credit card may is often easier for getting credit for the first time. 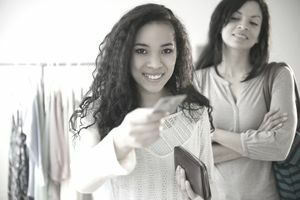 Once you've established a few months of credit history with a retail or gas credit card will help you qualify for a major credit card, like Visa or Mastercard. While retail and gas cards are easier to get, they also have higher costs. For example, the interest rate, which is essentially the cost of carrying a credit card balance from month to month, is higher on department store and oil company credit cards. On the bright side, having a positive history with one of these cards helps you qualify for a major credit card later on. And if you pay your balance in full each month (which you should), you won't pay any finance charges. You can also apply for a secured credit card. This is a type of credit card, that requires you to make a deposit to receive a credit limit on your credit card. Some secured credit cards will convert to non-secured cards after 12 to 18 months of positive credit history. Typically, a person must be 18 to receive a credit card or a loan. Teenagers under 18 may be added as authorized or joint users of a credit card. Major credit cards, like Visa and Mastercard, typically do not offer credit to applicants that are underage. To get a credit card under age 21, you'll have to provide proof of your income or have a cosigner get a joint credit card with you. Don't be so eager to get started with credit that you make a mistake that hurts your chances of getting approved. Here are some things to keep in mind when you're applying for credit for the first time. Avoid making several applications for credit. Each time you apply for credit, an inquiry is added to your credit report. Too many inquiries in a short period of time can make it appear as if you are desperate for credit. Credit card issuers will be less willing to give you a credit card. Be wary of credit card offers that guarantee approval regardless of your credit history. Offers like this are usually credit card scams that end up costing much more than you spend. Once you obtain a credit card, it will be important for you to use it wisely. That means charging a balance that you can afford to repay and making all your monthly payments on time. Limit the number of credit cards you start out with. Taking on too many credit cards at once puts you at risk of creating more debt than you can afford to repay. Starting out with just one credit card is typically best.